The Lady Scots won the team title at the 2018 Rudder Invite on Friday with their highest optional team score this season. Junior Tatum Meeks won Bars, was 2nd on Beam, 3rd on Vault, 8th on Floor and 2nd All-Around. Her highest score of the meet was 9.65 on Vault. Junior Lily Overton placed 2nd on Floor, 3rd on Beam, 4th on Bars, and 3rd All-Around. She scored a season high on Beam. Her highest score of the meet was 9.5 on Floor. Senior Allison Walters placed 5th on Beam, 6th on Bars, and 7th All-Around. She scored season highs on Bars and Beam. Her highest score of the meet was 9.0 on Beam. Junior Captain Katherine Downing placed 8th on Floor and 10th on Beam. Katherine scored season highs on Bars, Beam, and Floor. Her highest score was 9.2 on Floor. Senior Grayson Gale competed in the All-Around and scored season highs on every event. Her highest score of the meet was Floor. Freshman Megan Mulcahy competed on three events and scored a season high on Beam. Her highest score of the meet was Vault. Freshman Carly Hart competed on Floor. 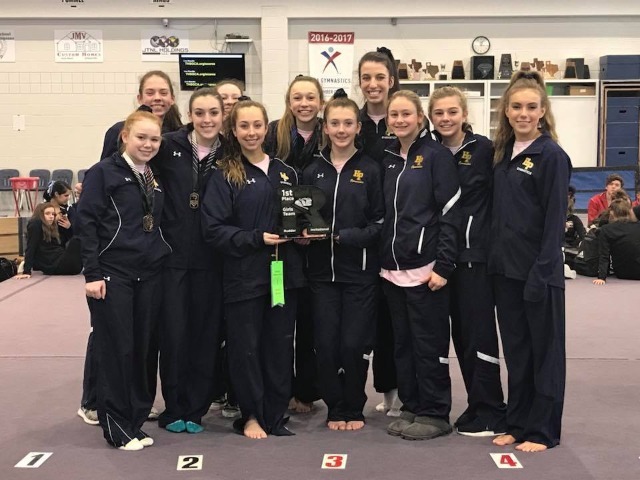 Highland Park Gymnastics begins post season competition on March 27 at District Championships hosted by Richardson ISD.